The red e-Go stole the show and received even much more attention than the Ibis. Michael Hu, President of 2050 Motors, Inc. (OTCQB: ETFM), today announced the success of the Company's private showing of the two all carbon fiber electric models in Las Vegas during the Valentine's Day and Chinese New Year Weekend. The automotive industry, political representatives and news media received the event with great enthusiasm. Mr. Velotta continued, “The 2050 Motors vehicles are the first electric vehicles manufactured with carbon fiber materials. That makes them lighter and stronger than conventional vehicles, giving them added range. Company officials say their cars will have a range of more than 200 miles on a charge. “Joe LaStella, 2050's senior engineering consultant, said the company has worked to keep itself under the radar until it completed five milestones: designing a car with carbon fiber, building a production plant, developing a supply chain, creating a distribution network for sales and passing U.S. Department of Transportation crash test standards. “LaStella said the company has completed the first four milestones and felt it was close enough on the fifth to show off the car as a celebration of the Chinese New Year. The Las Vegas Review-Journal article also explained,“The Las Vegas Company officials say the e-Go, which seats four passengers, would sell for $25,000 after federal energy efficiency tax credits. The five-passenger Ibis, which is 800 pounds lighter than the Tesla Model S sedan, would sell for $59,500 after tax credits, [which is] less than the cost of a Tesla. “2050 [Motors] may seek state tax incentives, just as Faraday did. "2050 Motors has been negotiating for well over a year with municipalities to finalize plans for job creation. Both state governments and municipalities are offering considerable incentives for job creation," the company said in a January press release. 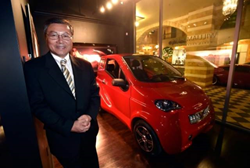 Mr. Hu, whose picture is featured in the article alongside the e-Go commuter model vehicle, went on to say, “We all thought that the Ibis – the e-Go's big brother which is a four door carbon fiber body luxury electric sedan – would be the feature of the show. However, the red e-Go stole the show and received even much more attention than the Ibis. “Some of the most memorable comments from viewers include that the Ibis looked either like a Maserati or a Rolls Royce before they were told that it was a new carbon fiber electric automobile. The showcasing event was a great success and was well attended. In fact, 2050 Motors decided to extend the showcase beyond February 22 until February 29 and considers extending the show even further. The display is open from 10 AM to 4 PM seven days a week at the world famous William Carr Gallery (http://williamcarrgallery.com/) located in the newly constructed Tivoli Village Mall, 400 S. Rampart Blvd., Ste. 105, Las Vegas NV 89145. People interested in viewing the vehicles on display and are planning to attend the gallery, we are cordially asking them to please register by emailing us at info@2050motors.com with the subject “Attending Gallery” so that we may accommodate all of our visitors.